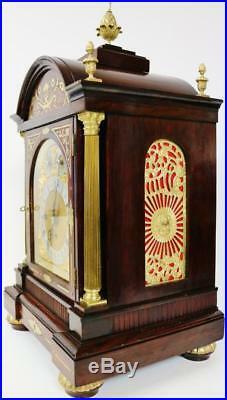 This clock is a truly exceptional antique English boardroom arched top rosewood and bronze triple fusee musical 8 bell bracket clock of superb proportions and of the highest quality in excellent condition The case features a arched top design with its original finish that looks absolutely beautiful on display, at the top it has a large acorn bronze finial with 4 matching smaller bronze finials to each corner all in excellet condition The case has superb elebrate pierced bronze fret sounding panels to either side with red silk behind them, the clock sits securely on 4 solid bronze and rosewood feet that have their ormolu finish to them On the front of the case their are various brass boulle inlaid decorations which are all in excellent condition and reall make this bracket clock stand out from the rest The case is in amazing condition for age with a hinged glazed front door and a hinged glazed back door with original locks, the door locks are in working order with the same original key The rosewood case has a stunning colour and patina to it which is acquired through age. 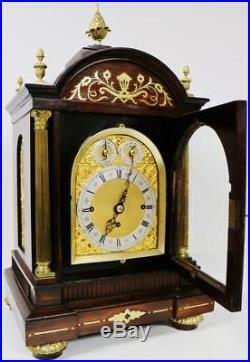 This is exactly how i have received it and it looks 100% better in the flesh The clock features a high quality brass and silvered dial with matted centre and 2 subsidary dials to the top arch. The two subsidary dials to top both do a job, one is for choice of Westminster on 4 bells or whittington on 8 bells and the other is for the option of silent/chime, the dial has engraved roman numerals on the silvered chapter ring and original hands again all in great original condition, the dial has various bronze ornate spandrels which are all in excellent condition and have their original ormolu finish The clock has a superb quality English triple fusee musical chain driven movement striking on 8 bells. Looks absoultely fantastic wherever it is displayed and a true talking point of any room. 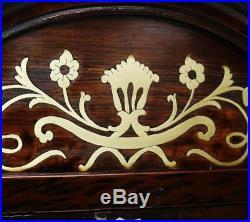 Antique English Rosewood & Bronze Triple Fusee Musical 8Day 8 Bell Bracket Clock. Video will open in a new window. PLEASE NOTE : I have just received some excellent quality bracket clocks from a private collection all of which have been well looked after all of which will be listed over the next few weeks. 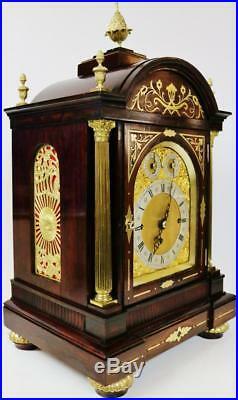 Some excellent quality bracket clocks please keep your eyes open over the next few months. This clock is a truly exceptional antique English boardroom arched top rosewood and bronze triple fusee musical 8 bell bracket clock of superb proportions and of the highest quality in excellent condition. 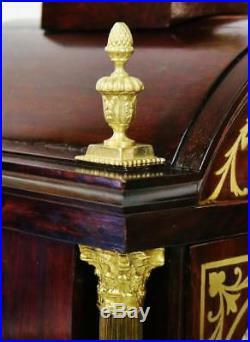 The case features a arched top design with its original finish that looks absolutely beautiful on display, at the top it has a large acorn bronze finial with 4 matching smaller bronze finials to each corner all in excellet condition. 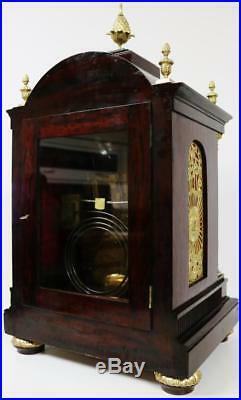 The case has superb elebrate pierced bronze fret sounding panels to either side with red silk behind them, the clock sits securely on 4 solid bronze and rosewood feet that have their ormolu finish to them On the front of the case their are various brass boulle inlaid decorations which are all in excellent condition and reall make this bracket clock stand out from the rest The case is in amazing condition for age with a hinged glazed front door and a hinged glazed back door with original locks, the door locks are in working order with the same original key The rosewood case has a stunning colour and patina to it which is acquired through age. The quarter chiming musical chimes every quarter of an hour on 8/4 bells and the hourly strike on a seperate gong on the hour after the musical chimes have finished playing The movement is in perfect working order chiming superbly and ticks away beautifully as im sure you can see and hear in the video above The movement comes with its original pendulum all working fantastically keeping perfect time as you would expect from a high quality clock. The clock measures an impressive 25 inches high x 14 inches wide x 11 inches deep and looks super impressive wherever it is displayed This is a perfect investment clock and a beautiful display piece. 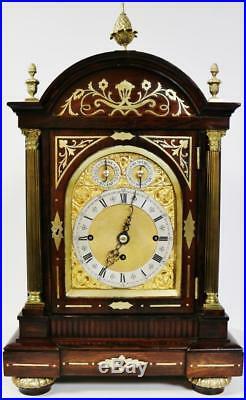 Exceptional clock which will only grow significantly in value over the years and you will be hard pushed to find another one like it. 1 - We offer the very best customer service before, during and after the sale. You are more than welcome to personally collect any item free of charge. All my items will be packed professionally. 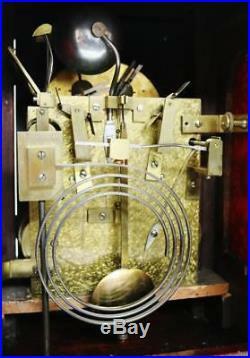 No matter how well antique clocks have been serviced they will need final adjusting and setting into beat after transport and a professional person is advised and may be required in order to do this. 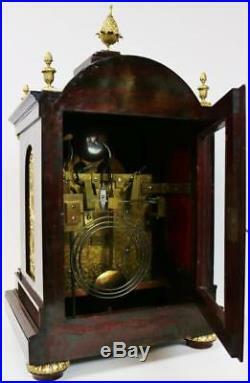 All repairs needed to the mechanism will be carried out by myself and not by a 3rd party clock maker/repairer unless agreed by myself beforehand. Please contact me for a quote if you have another movement that requires servicing. 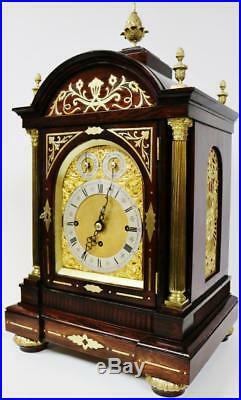 I will be mostly dealing in top quality original antique clocks all of which we have full confidence in and which we source from good collectors worldwide. Auctiva offers Free Image Hosting and Editing. The item "Antique English Rosewood & Bronze Triple Fusee Musical 8Day 8 Bell Bracket Clock" is in sale since Friday, April 13, 2018. 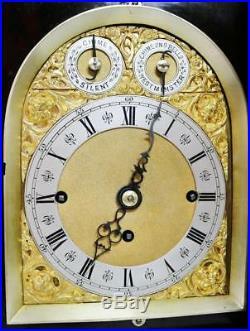 This item is in the category "Antiques\Antique Clocks\Bracket Clocks\Pre-1900". The seller is "classictime2015" and is located in Stonehouse. This item can be shipped worldwide.